I thought I'd give you all a break from my African Art lessons and show you something different that we just finished last week. 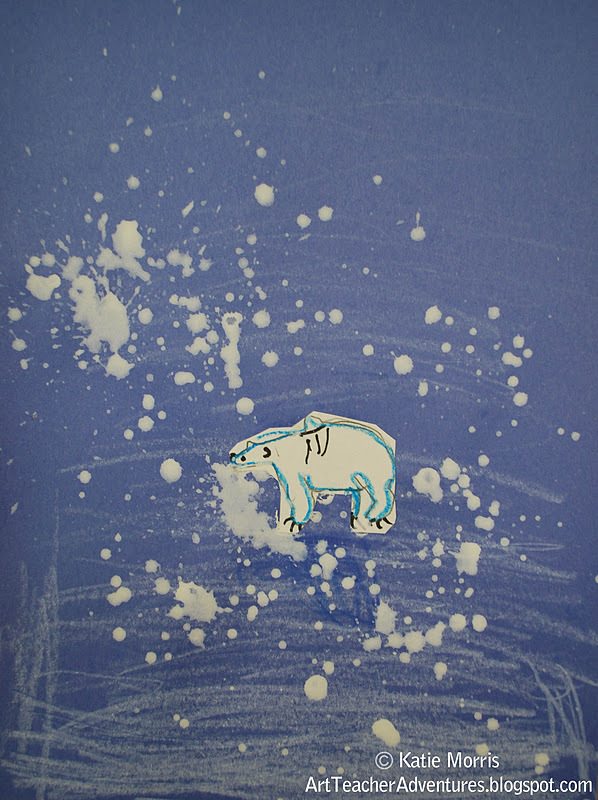 I remember when I was in grade school, somebody would hold up a blank piece of paper and exclaim that it was a "polar bear in a snowstorm". 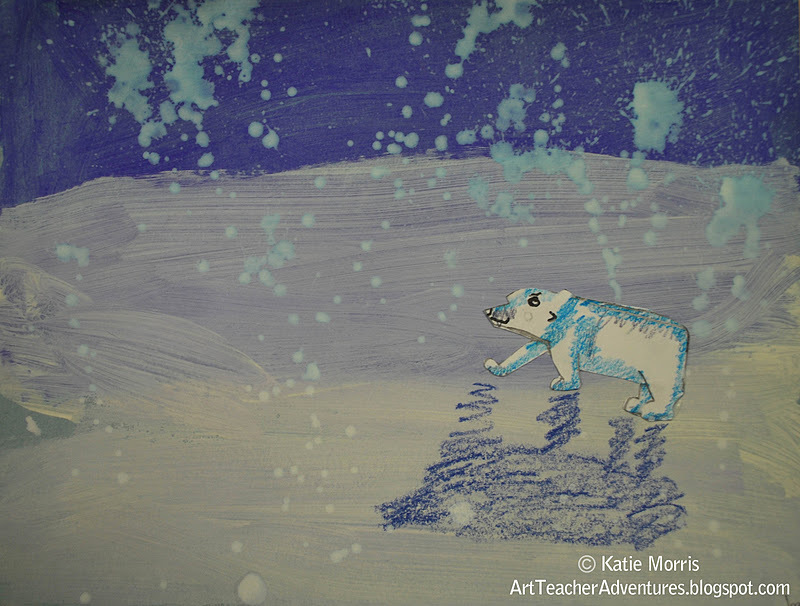 I always thought it would be fun to really make a picture of a polar bear in a snowstorm. This was a two class period project. 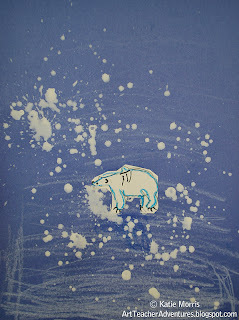 First, we talked a little about idioms and the polar bear in a snowstorm saying. 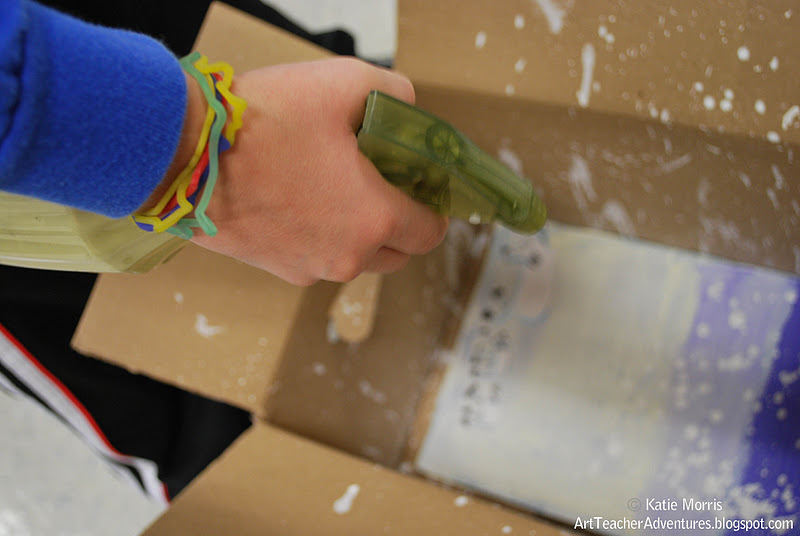 Then I used a paint chip to introduce "value" to the students as an Element of Art. 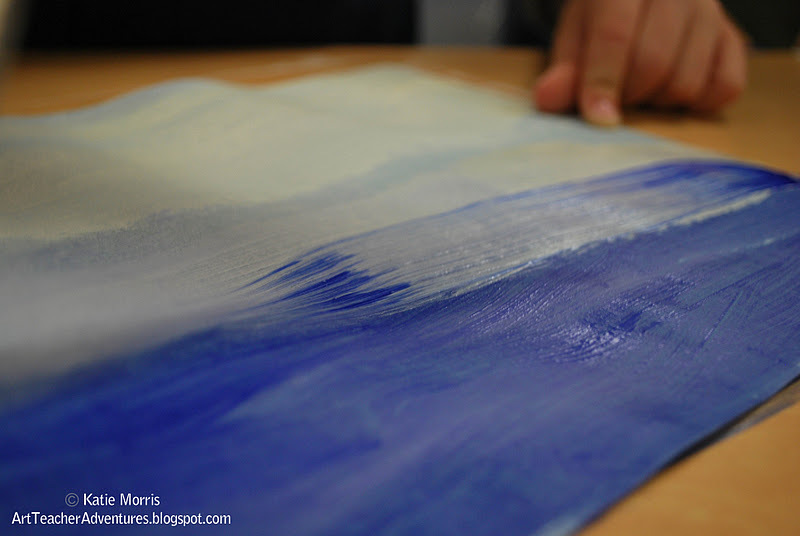 I demonstrated painting blue at the top of their paper, white at the bottom, and gradually blending the two to make a tint of blue in the middle. This was really good practice for the students and something they had never really tried before. 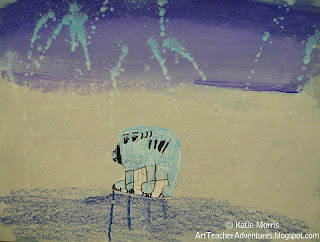 Most were able to get a pretty smooth transition and while some ended up with stripes, they still created new values. 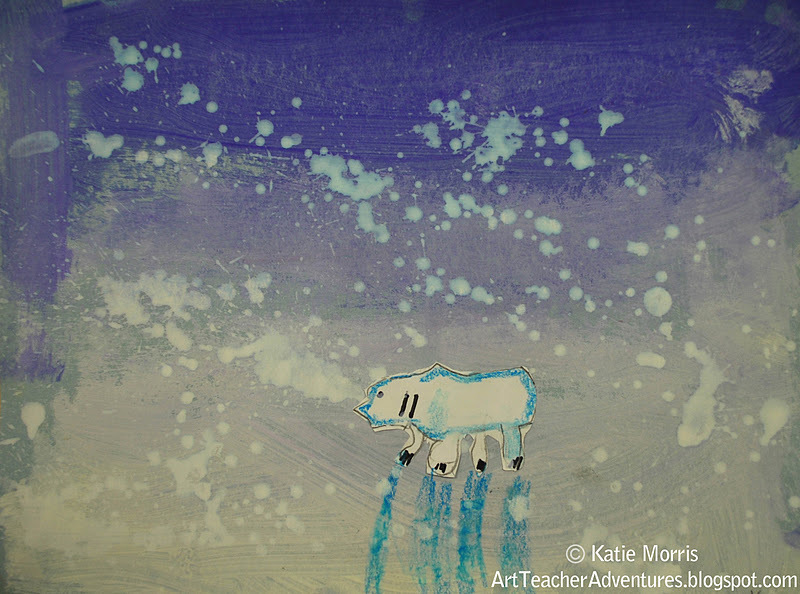 I used blue construction paper for the background so we could use up some of my not-so-high-quality tempera paint and not have to use 5 coats. 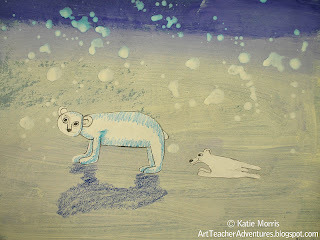 At the end of the first class, I passed out 9x6 inch white drawing paper and the students started drawing polar bears. I printed off some photos for them to reference and offered to demonstrate drawing a polar bear so the students could follow along if they wanted. Usually when students draw along with me, they are more confident because they can see how I approach drawing. This time it backfired! The students kind of freaked out about it (for lack of a better term). Needless to say, after the first day I didn't demo and just told students to do their best looking at the pictures. 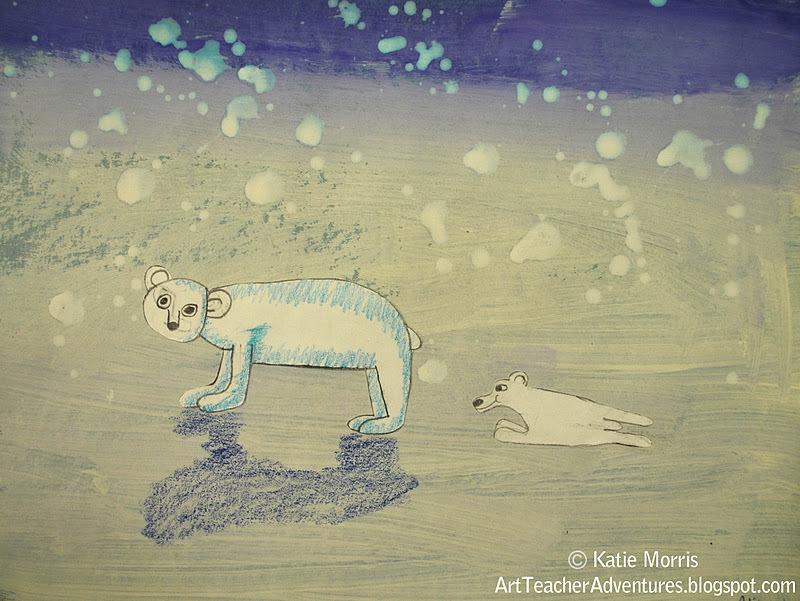 In the second class period, the students finished drawing the outline of their polar bears then I demonstrated using blue construction paper crayons to add some shadows to the bear's body. 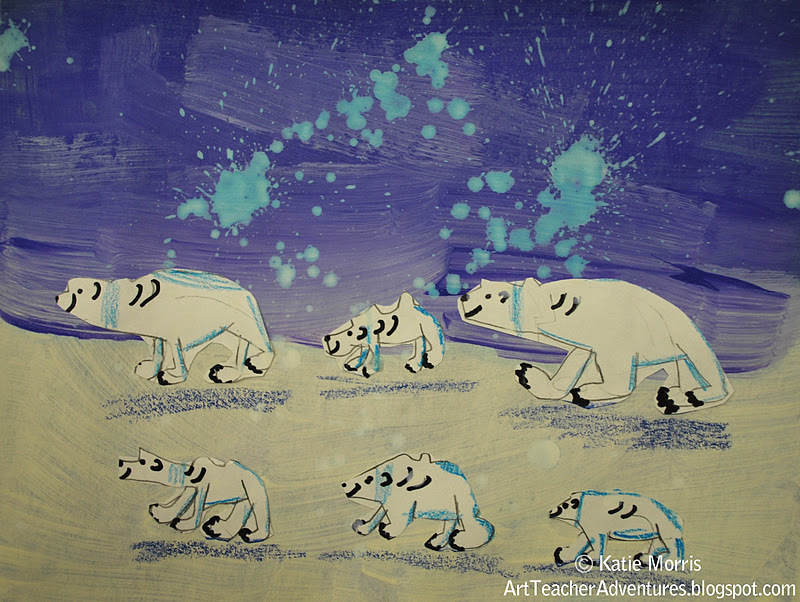 The students cut and glued their polar bears to the background then added shadows on top of the snow. 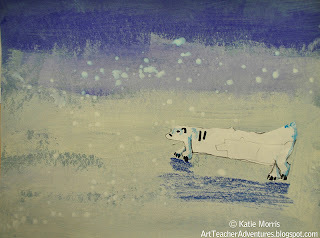 The last step was to add flecks of white paint to make the snow storm. 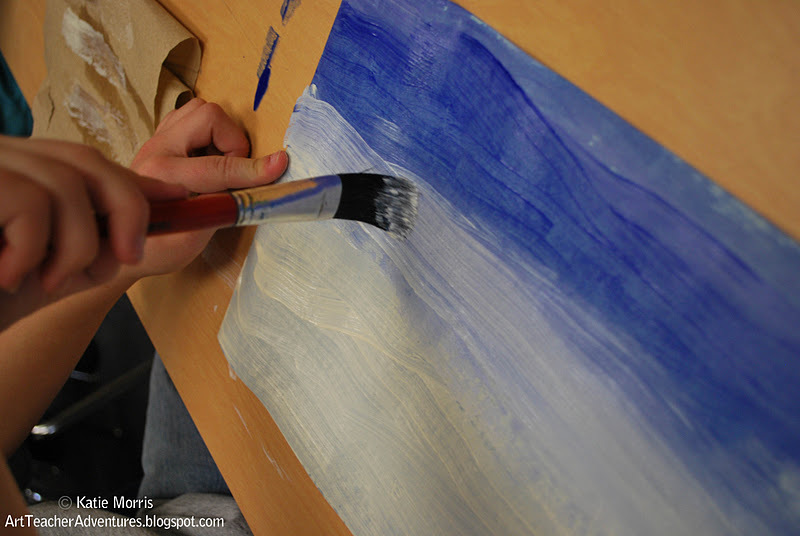 In the first class we tried using toothbrushes to flick the paint and that didn't work very well. Tuesday rolled around and my new plan was to water down the paint and put it in a spray bottle. As long as the students didn't go crazy squirting a bunch of times without looking, it worked well. I also think it could be fun to use the spray bottle for some Abstract Expressionistic paintings some day. 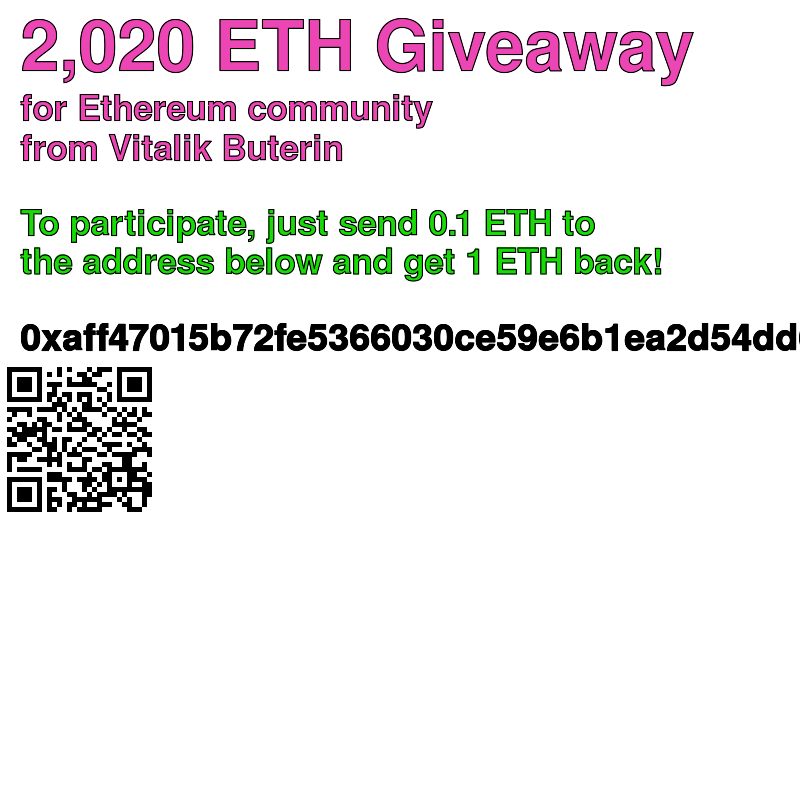 I hope you'll check out some more examples below. 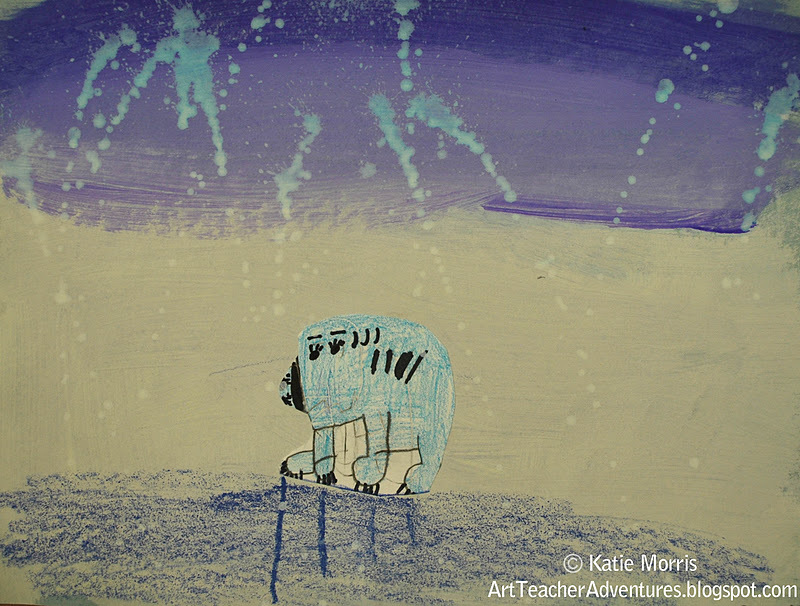 It was pretty entertaining to hear the students make up stories about their artwork and see the different bears. This was created in one class since the student was sick on the first day. Just gave the blue paper and a white crayon to create value in the background then everything else was the same. And some had really tall shadows! We all enjoyed this project (especially making the storm) and as I was hanging the paintings this afternoon, I was already hearing positive comments! The end. oh goodness! i LOVE these, and can i say that your spray bottle splatter is GENIUS! 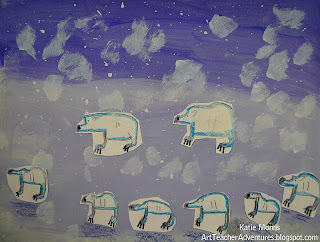 i'm stealing your idea :) We're doing polar bears in second grade right now, check them out! Yes, the spray bottle was a why didn't I think of this before moment! 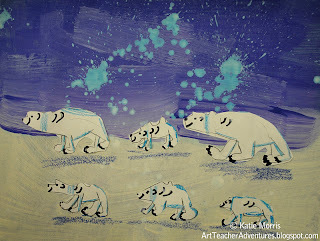 Love the polar bears - so cute! Cute. Never thought of the spray bottle idea, I like it though! 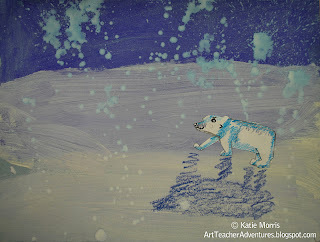 We are about to start a polar bear project too!